You will be given an exclusive territory to develop your Papa Ray's franchise. Once your site is approved, you will have a protected area for your Papa Ray's Pizza Restaurant. This area will have a minimum radius of 3 miles from other Papa Ray's Pizza Restaurants. The boundaries will be determined based on population density, existing competition and other relevant factors. The initial fee for one franchise is $25,000. Minimal start-up costs can be as low as about $173,230 in cash, liquid assets, available financing, or a combination thereof. We make starting a Papa Ray's as easy as possible. We aggressively negotiate the lease with you to get the best pricing and actively help you find the best prices on all the necessary equipment. 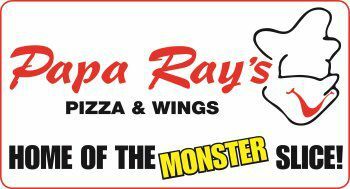 Papa Ray's Pizza collects a 5% royalty fee of gross sales. We succeed when you succeed. The cost of advertising varies by location, based on a number of factors. Papa Ray's Pizza Franchise assists franchisees in developing a suggested budget determined by the prospective location's demographic. Advertising costs for franchises are a minimum of $4,333 per month.